Create a unique plan to suit your need now, you can modify or switch packages as you want. Payment Plan: Annually Monthly Get two free months paying annually! Some options are available only annually, because it's low cost. Storage Options: Choose how much disc space you need to store all messages from your domain mailboxes. Monthly delivery limits: Choose how many email messages all domain mailboxes can send monthly. Quantity of Mailboxes: Unlimited Create as many email accounts you want without pay anything else. Share the resources above between all your domain mailboxes. Choose the total resources for your whole domain and distribute it among all your email accounts as you wish. There are no limits for the number of emails you can use for this service. Incorporate all the email accounts you need absolutely free. Share your plan features among all your domain mailboxes and allocate as you wish. Order just what you need for all your domain mailboxes. Share the storage among all email accounts as you wish. Take advantage of the option to upgrade the size of your domain storage when the need arises. Flexible storage options for your email accounts. Manage your storage; distribute among you emails according to the storage requirements per email. Choose the specific number of email deliveries required monthly for the individual email accounts linked to your domain. Take advantage of the upgrade options to increase the capacity of your domain on your current plan. Edit your options to modify the hourly/daily sending limits from your email accounts. Make this modification from the Webmail settings, monitor the delivery reports. Enjoy free deliveries within the same domain accounts. The number of emails sent within your domain will not be deducted from the limits set for your domain. Our service include tools to batch create email accounts, and also batch import your email messages from your old email provider. Our team will support you during all transfer steps. Quick, Reliable and innovative Webmail. 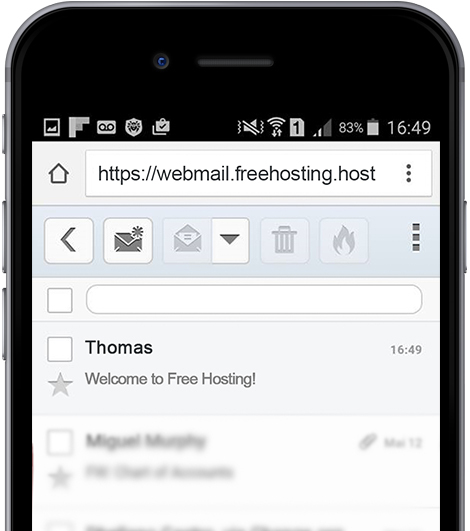 Manage and monitor all your email accounts on the go with your mobile devices. Take advantage of the efficient and flexible Anti-Spam filter to manage rules. Get more value by using the auto reply feature for emails, different types of filters, redirecting emails etc. Inbox is kept clean with scans using the best antivirus software. Access your account through Outlook or your favorite Smartphone email client. Configure and use the type of access that best suits your needs. Manage your email accounts from the Webmail settings from the preset admins for your emails with the outstanding self-service applications – white label management standards.